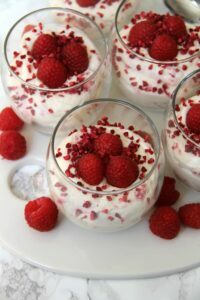 A Really Easy and Simple 3-Ingredient Individual Raspberry & White Chocolate Mousse. Perfect Dessert for any occasion! I love White Chocolate, its so sweet and yummy and moreish. However, it can be quite understated sometimes. 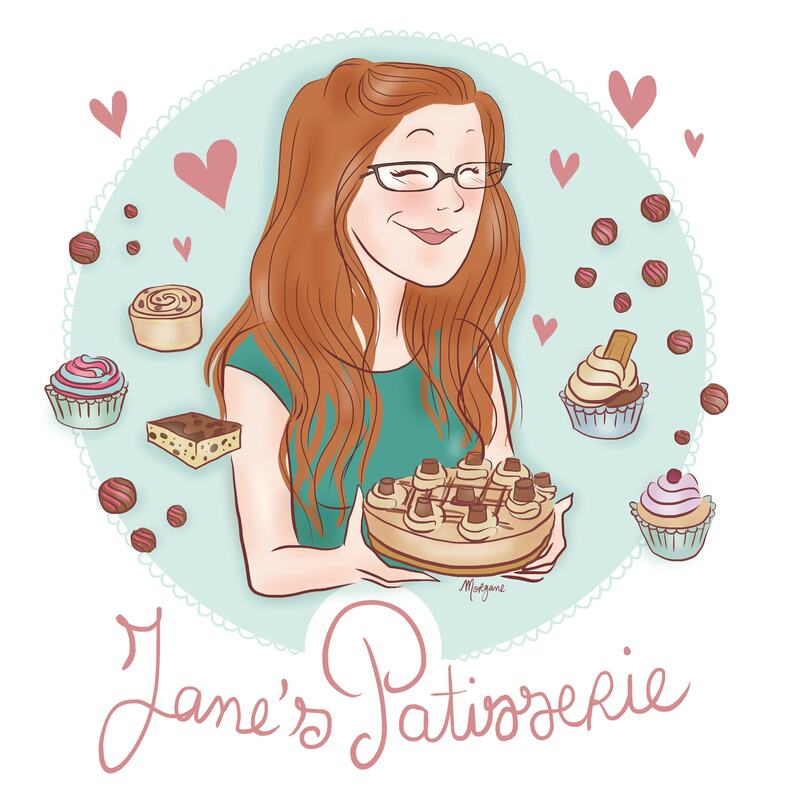 I love to bake with it, but even myself I don’t have many recipes that use it in comparison to Milk Chocolate. 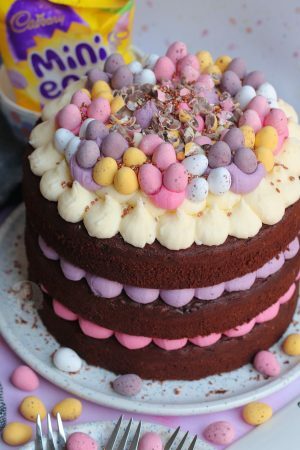 You can easily make this recipe with Milk or Dark chocolate (quantities stated in the Tips and Ideas section below) but I wanted to use White. I wanted something DELICIOUS. 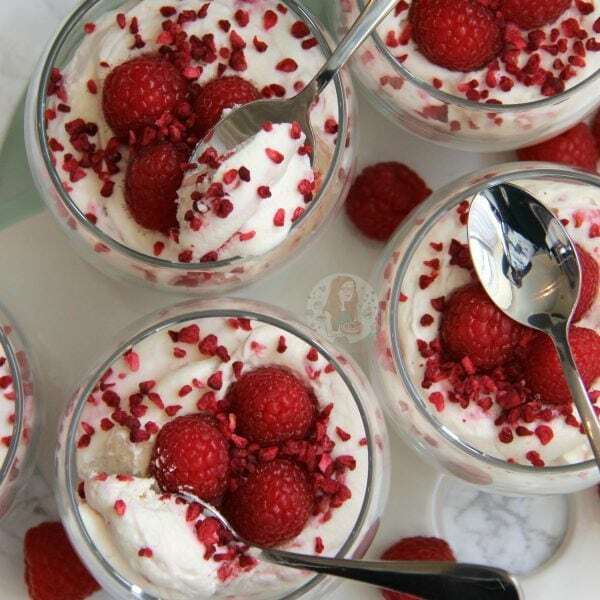 However, to take this to another level, I wanted to use Raspberries as well. 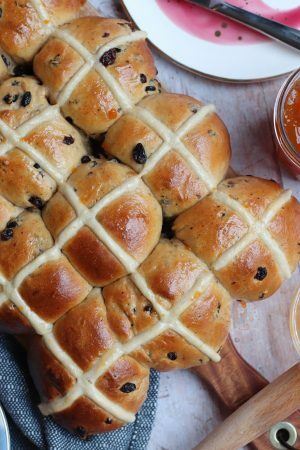 I found this delicious recipe from Pretty Simple Sweet and knew it was something I had to try out! 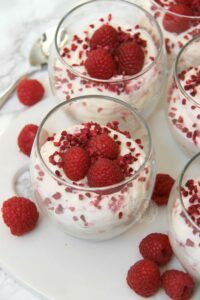 I wanted to change it up slightly, and use raspberries in the actual mousse to give it a bit of texture, give it some colour, and a new element of flavour. I changed up the quantities as I wanted to have more Mousse per person, and I wanted to have more servings. I used some Mixer Glasses for these that I bought from Tesco, as I wanted small drinks glasses in general, but they are perfect for desserts like this. 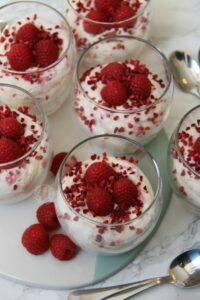 You can realistically make one giant Mousse and serve it out of a pretty dish, but I like individual desserts sometimes. I think that they can look really pretty themselves, but I added some optional Freeze Dried Raspberries to give these a little more show. If you want something thats really easy to make, some sweet, delicious, and only three ingredients, you will LOVE this recipe. It’s so unbelievably easy to make its ridiculous! I hope you love this as much as I did, ENJOY! 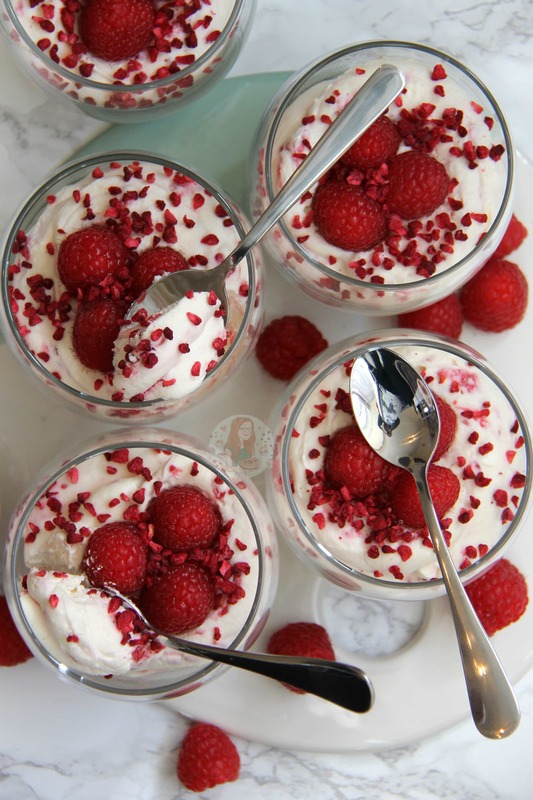 A Really Easy and Simple 3-Ingredients Individual Raspberry & White Chocolate Mousse. Perfect Desserts for Any Occasion! Prep your Glasses/Dishes that you're going to serve your desserts in. I cleaned my new mixer glasses! In a heatproof bowl, add all of the chopped White Chocolate, and 65ml of the double cream and microwave on a medium/low heat till smooth. You'll want to stir it halfway through to make sure its smooth, and it will take less time then you think to melt. Do it in bursts of 30 seconds max! Whilst leaving it to cool, whip the rest of the cream to soft peaks. Not so solid that you can pipe it, but still so it holds itself. Add a dollop of the whipped cream to the chocolate mix and stir it though so its smooth. Add in the rest of the cream and fold through carefully making sure to not knock out too much air from the cream. 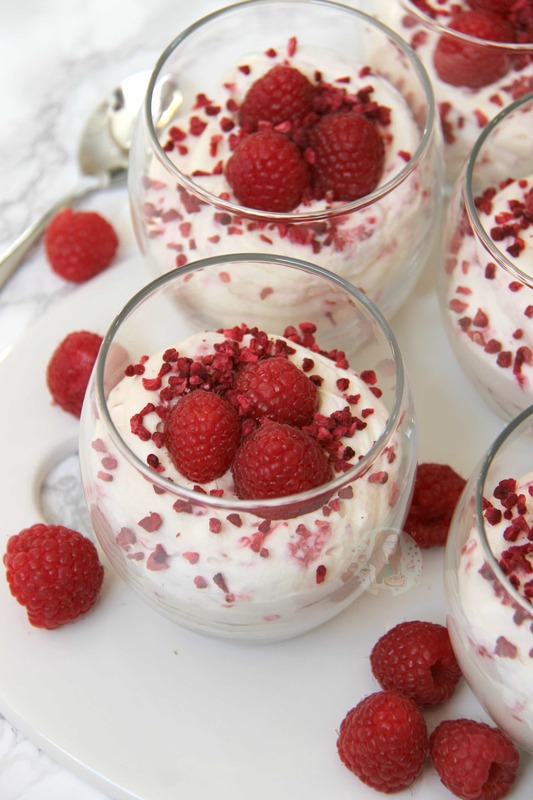 Reserve some of your raspberries for decoration. In a different bowl, mash the rest of them slightly, and then fold through the Mousse mixture. 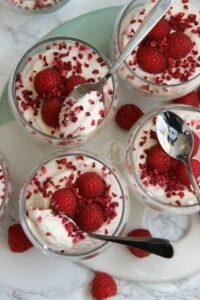 Pour/Scoop/Pipe your mousse into the glasses, and decorate with the rest of the fresh raspberries and the freeze dried raspberries! 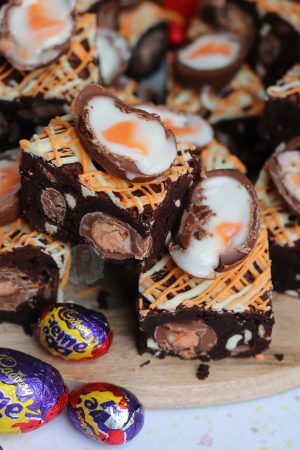 You can use milk or dark chocolate in the mix if you wish instead. If using Milk Chocolate, I would use 200g, and if using Dark Chocolate, I would use 175g. You can switch the raspberries out for a different fruit, such as strawberries. I used Mixer Glasses to serve mine in as I like the shape, but you can use whatever you fancy! 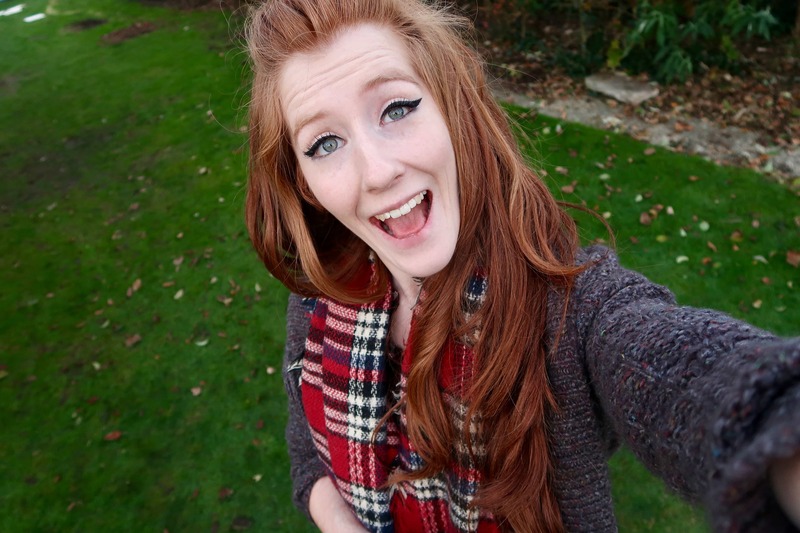 I find Freeze Dried Raspberries in Waitrose, Sainsburys, and Lakeland! These will last for 2 days after making! Older Next post: No-Bake Milky Way Cheesecake! Newer Previous post: Chocolate Chai Cupcakes! I live in the US. What is double cream? Your nearest is heavy cream I believe.